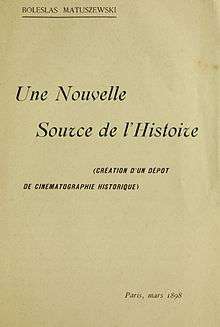 The cover of Bolesław Matuszewski book Une nouvelle source de l'histoire. 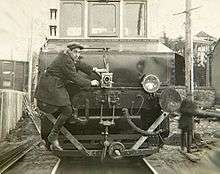 (A New Source of History) from 1898 the first publication about documentary function of cinematography. A City Symphony Film, as the name suggests, is usually based around a major metropolitan city area and seek to capture the lives, events and activities of the city. It can be abstract and cinematographic (see Walter Ruttmann's Berlin) or utilise Russian Montage theory (See Dziga Vertov's Man with the Movie Camera). But most importantly, a city symphony film is like a cine-poem and is shot and edited like a "symphony". Historical documentaries, such as the landmark 14-hour Eyes on the Prize: America's Civil Rights Years (1986—Part 1 and 1989—Part 2) by Henry Hampton, Four Little Girls (1997) by Spike Lee, and The Civil War by Ken Burns, UNESCO awarded independent film on slavery 500 Years Later, expressed not only a distinctive voice but also a perspective and point of views. Some films such as The Thin Blue Line by Errol Morris incorporated stylized re-enactments, and Michael Moore's Roger & Me placed far more interpretive control with the director. The commercial success of these documentaries may derive from this narrative shift in the documentary form, leading some critics to question whether such films can truly be called documentaries; critics sometimes refer to these works as "mondo films" or "docu-ganda." However, directorial manipulation of documentary subjects has been noted since the work of Flaherty, and may be endemic to the form due to problematic ontological foundations. National Geographic television collaborates local video production agencies to present the best content for viewers, APV delivered modern documentaries programming focussed on Hong Kong Local region with collaborating National Geographic. Fake-fiction is a genre which deliberately presents real, unscripted events in the form of a fiction film, making them appear as staged. The concept was introduced by Pierre Bismuth to describe his 2016 film Where is Rocky II?. Docu-eroticamentary is a hybrid genre from two basic ones, erotica or romance and documentary, the term coined by docu-eroticamentary author Gwendolyn Olmsted, from publisher AuthorHouse's Eight Weeks in May, and Part II of that book through publisher Amazon's The January Cruise. 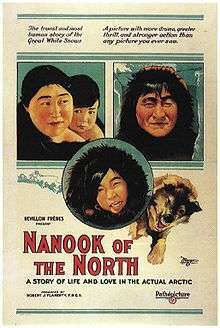 Compilation films were pioneered in 1927 by Esfir Schub with The Fall of the Romanov Dynasty. More recent examples include Point of Order (1964), directed by Emile de Antonio about the McCarthy hearings, and The Atomic Cafe which is made entirely out of found footage that various agencies of the U.S. government made about the safety of nuclear radiation (for example, telling troops at one point that it is safe to be irradiated as long as they keep their eyes and mouths shut). Similarly, The Last Cigarette combines the testimony of various tobacco company executives before the U.S. Congress with archival propaganda extolling the virtues of smoking. Observational documentaries attempt to simply and spontaneously observe lived life with a minimum of intervention. Filmmakers who worked in this subgenre often saw the poetic mode as too abstract and the expository mode as too didactic. 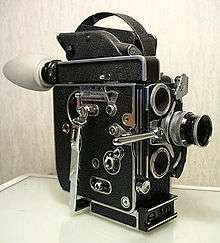 The first observational docs date back to the 1960s; the technological developments which made them possible include mobile lighweight cameras and portable sound recording equipment for synchronized sound. Often, this mode of film eschewed voice-over commentary, post-synchronized dialogue and music, or re-enactments. The films aimed for immediacy, intimacy, and revelation of individual human character in ordinary life situations. Another problem is the lack of postproduction script or the poor quality of the transcription. A correct transcription is essential for a translator to do their work properly, however many times the script is not even given to the translator, which is a major impediment since documentaries are characterised by "the abundance of terminological units and very specific proper names". When the script is given to the translator, it is usually poorly transcribed or outright incorrect making the translation unnecessary difficult and demanding because all of the proper names and specific terminology have to be correct in a documentary programme in order for it to be a reliable source of information, hence the translator has to check every term on their own. Such mistakes in proper names are for instance: "Jungle Reinhard instead of Django Reinhart, Jorn Asten instead of Jane Austen, and Magnus Axle instead of Aldous Huxley". ↑ Charles Ford, Robert Hammond: Polish Film: A Twentieth Century History. McFarland, 2005. ISBN 9781476608037, p.10. ↑ Journal of Film Preservation, nr. 70, November 2005. ↑ Ţuţui, Marian, A short history of the Romanian films at the Romanian National Cinematographic Center. Archived April 11, 2008, at the Wayback Machine. ↑ The Works of Gheorghe Marinescu, 1967 report. ↑ Excerpts of prof. dr. Marinescu's science films. Archived February 26, 2015, at the Wayback Machine. 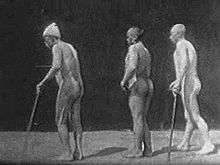 ↑ Miriam Hansen, Babel and Babylon: Spectatorship in American Silent Film, 2005. ↑ Rees, A.L. (2011). 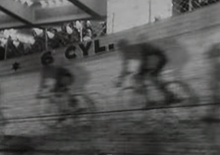 A History of Experimental Film and Video (2nd Edition). Palgrave Macmillan. ISBN 978-1-84457-436-0. ↑ Johnson, Ted (2015-06-19). "AFI Docs: Filmmakers Get Savvier About Fueling Social Change". Variety. Retrieved 2016-06-23. ↑ "social impact campaigns". www.azuremedia.org. Retrieved 2016-06-23. ↑ indiewire.com, "Festivals: Post-Sundance 2001; Docs Still Face Financing and Distribution Challenges." February 8, 2001. ↑ Campion, Chris (2015-02-11). "Where is Rocky II? The 10-year desert hunt for Ed Ruscha's missing boulder". The Guardian. ISSN 0261-3077. Retrieved 2016-10-22. ↑ Matamala, A. (2009). Main Challenges in the Translation of Documentaries. In J. Cintas (Ed. ), New Trends in Audiovisual Translation (pp. 109-120). Bristol, UK: Multilingual Matters, p. 110-111. Emilie de Brigard, "The History of Ethnographic Film," in Principles of Visual Anthropology, ed. Paul Hockings. Berlin and New York: Mouton de Gruyter, 1995, pp. 13–43.